The Conflow Code 222A - Weighted Lever Valve is used to supply large volumes of water to fire barrier systems. The valve is pilot operated so that the pressure energy of the system is used to open and close the valve itself. A small pilot valve is used to divert system pressure to open and close the main valve thus achieving control of high volume fluid with minimum mechanical effort. 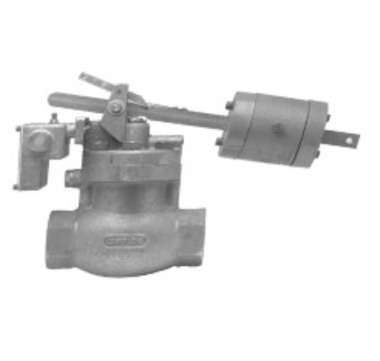 The pilot valve is operated by a lever which falls under gravity due to a weight fixed to it. The weight is normally held in position with a wire rope, remotely secured and held in tension by the weight. Thermal links, spaced along the wire are activated by a rise in temperature, which relaxes the wire allowing the weight to fall and open the valve.